Nanotechnology for Microelectronics and Photonics, Second Edition has been thoroughly revised, expanded, and updated. The aim of the book is to present the most recent advances in the field of nanomaterials, as well as the devices being developed for novel nanoelectronics and nanophotonic systems. It covers the many novel nanoscale applications in microelectronics and photonics that have been developed in recent years. Looking to the future, the book suggests what other applications are currently in development and may become feasible within the next few decades based on novel materials such as graphene, nanotubes, and organic semiconductors. 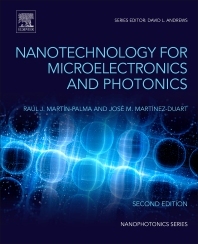 In addition, the inclusion of new chapters and new sections to keep up with the latest developments in this rapidly-evolving field makes Nanotechnology for Microelectronics and Photonics, Second Edition an invaluable reference to research and industrial scientists looking for a guide on how nanostructured materials and nanoscale devices are used in microelectronics, optoelectronics, and photonics today and in future developments. Raúl José Martín-Palma is Adjunct Professor of Materials Science and Engineering at Universidad Autonoma de Madrid, Spain. His research interests include work in nanostructures and nanotechnology, optics and photonics. José Martínez-Duart is Professor of Physics at Universidad Autónoma de Madrid, Spain. He is the author about three hundred publications in peer-reviewed scientific journals. During the 70s, he was Assistant Professor at Penn State University and Rensselaer Polytechnic Institute, and Research Visiting Scientist at the IBM T.J. Watson Research Center. Later was the Director of the Solid State Physics Institute (CSIC) at Madrid, and the Applied Physics Department at Universidad Autónoma, Madrid. He is the former President of the European Materials Research Society (EMRS), 2000-1, and the first President of the Spanish Materials Society. During the last twenty years he has been working on the electronic and optoelectronic properties of nanostructured materials. His previous books several books with Elsevier, serving as Co-Editor of the two-volumes, “Materials and Processes for Submicron Technologies” and “Current Trends in Nanotechnologies, as well as the first edition of the current book.